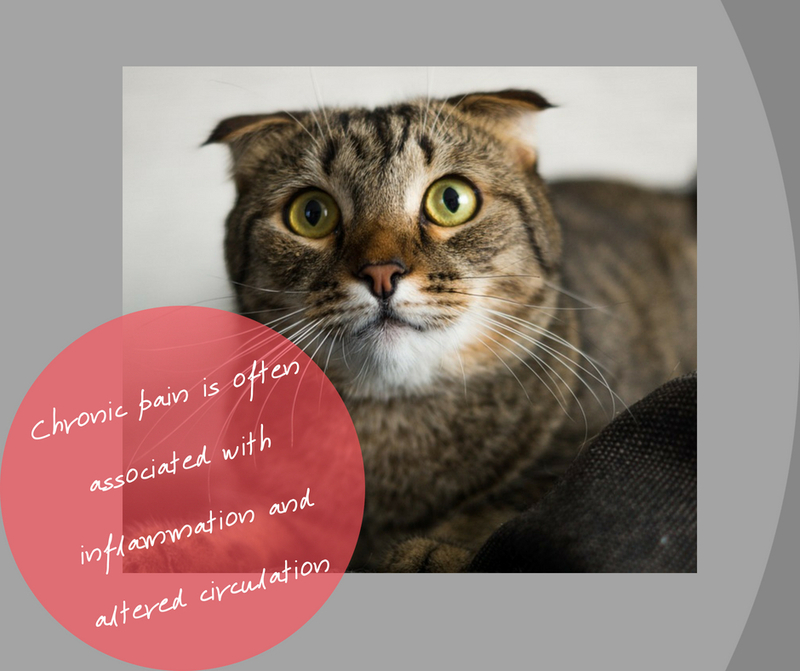 In Western medicine, pain is defined as a complex phenomenon that includes both the sensation and the subsequent behaviors that occur as a response. In Eastern medicine, pain is the manifestation of stagnant Qi or blood. Essentially, it is energy that is caught in one area creating pain and loss of function. Longstanding stagnant energy eventually leads to permanent structural changes, such as arthritis. In Western medicine, the primary classes of drug treatment for pain include non-steroidal anti-inflammatories, like Rimadyl, and opioid-like drugs, such as Tramadol. These classes of drugs are also important in integrative medicine, as a multimodal approach that includes a variety of treatments is the ideal way to treat both acute and chronic pain. Eastern medicine differs only in that an underlying pattern of disharmony is sought and the addition of other treatment modalities, such as herbal formulas, diet, acupuncture, and massage, may be included. All these therapies work together to correct the disharmony, support the healing process, and strengthen the body. Integrative management addresses both the symptoms of pain and the underlying deficiencies that lead up to it. It can also be very helpful for pets that cannot tolerate medication. In Eastern medicine, Qi and blood flow together through channels. Most channels are also associated with an organ or organ system. For example, knee pain is associated with a disharmony in the stomach channel, while hip pain is associated with the gall bladder channel. Disruptions in this flow allow Qi to pile up in one area, which becomes painful and hot. These disruptions also deprive the area “downstream” of Qi, causing weakness and cooling. This dovetails with our knowledge that chronic pain is often associated with inflammation and altered circulation. They are simply different words for the same phenomena. Manifestations of Qi stagnation, or an obstruction on an energetic level, often include muscle spasms. The pain may come and go quickly. This is not always easy to identify in our pets, but it may look like a dog that yelps when he/she moves a certain way. There is no permanent damage at this stage, so the prognosis for treatment is good. Blood stagnation occurs when the obstruction in energy flow takes on a physical manifestation. The pain may feel more stabbing and localized to a specific area. At this stage, we start to see limitation in strength and range of motion in the joints. Therapeutic outcomes become more variable and limited, although improvement is often seen. Both acupuncture and Chinese herbs can be effective in treating painful Qi and blood obstructions. 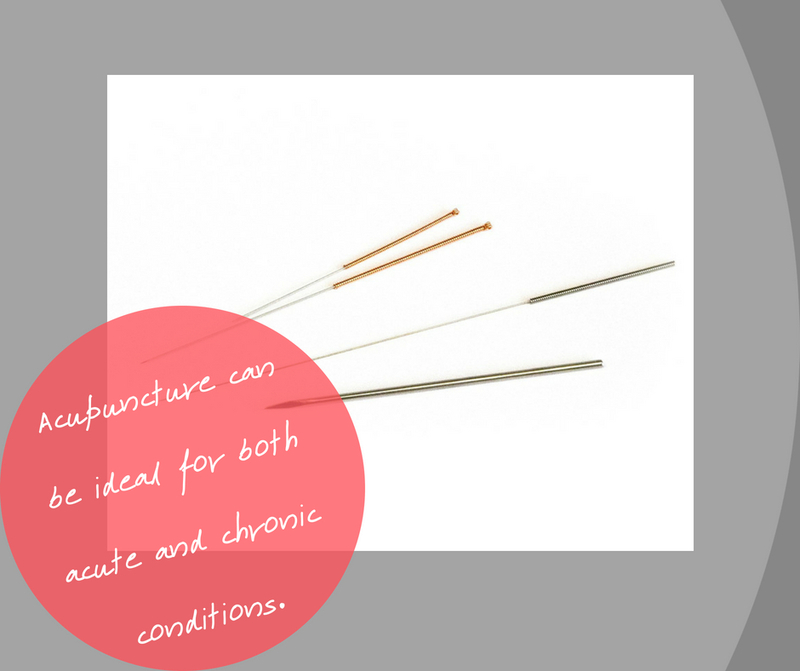 Acupuncture is more specific for treating painful joints or uncomfortable areas of the body. It is ideal for both acute and chronic conditions. Most painful patients present with a chronic condition or an acute flare-up of a chronic condition. The more chronic the condition is, the more likely that herbs can be beneficial because they also help treat the underlying cause of the obstruction, as well as nourish any deficiencies. Most herbs used to treat pain work by invigorating circulation and relieving inflammation. This is also true of many foods chosen for therapy. 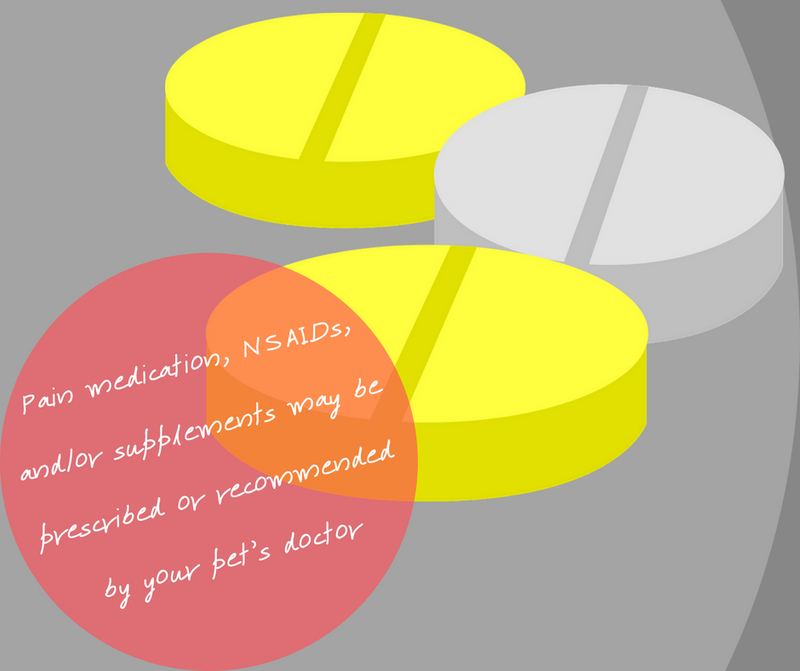 Your veterinarian can help you formulate a nutrition and/or supplement plan for your dog or cat. Integrative medicine, like Western, also stresses the importance of diet, exercise, weight loss and treatment options like laser and physical therapy. Pain, especially chronic pain, is much more effectively treated using more than one method. This is where an integrative approach can really help. For more information about all of our pain management services, please contact us! Visit our office for the latest in cutting edge medicine and fantastic customer service!